Make these. Tonight. You won't be sorry. They're delicious. I promise. As long as you love raspberry and chocolate. And if you don't, what are you doing here? That's it! That's all you need. Not one thing more. Promise. Well, a 9x13 pan might be nice. Anyway this recipe originally came from here, but I changed it a little so I'll rewrite it at the end of this post. 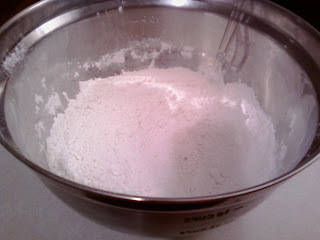 It begins, of course, which whisking together flour, sugar and cinnamon. Doing well so far. Then cut in the butter with a pastry cutter or dinner fork. 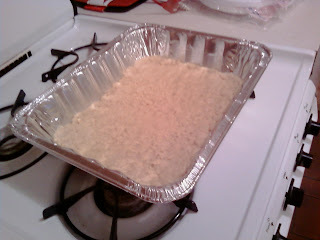 Press most of the mixture into the bottom of a greased pan and bake for 15 minutes. 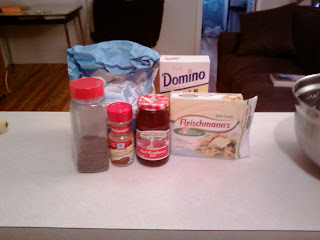 When that comes out, sprinkle it with the mini chocolate chips. Watch them start to melt. Wipe the drool off your chin. Yes, you could use regular chocolate chips, but you might want to spread them evenly a little before the next step. Which involves gently dolloping raspberry jam evenly over the base. 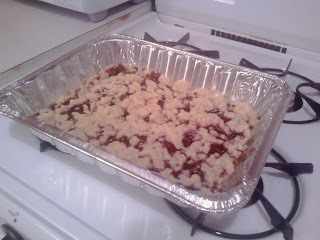 Then top with your reserved crumb base. And bake for another 20 minutes. 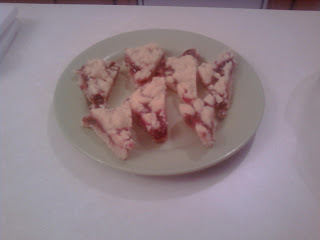 And cut into triangles. Or squares. Or hearts, stars and shamrocks. Or leave them in the pan and watch them quickly disappear. Because they're so good. I know I said that several times already, but I just wanted to make sure you understood. 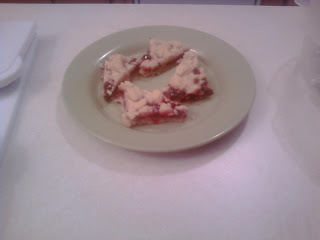 Mmmmm now I want to make these again to eat more. But I think I'll have to settle for the raspberry sorbet in my freezer. Tip of the Day: If you want to test a cake for doneness that's deeper than a toothpick, try using a piece of raw spaghetti instead. But don't let it break off! 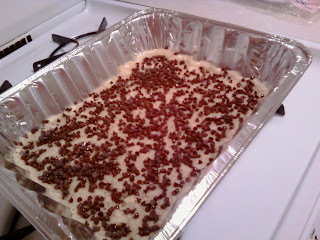 Remove, and sprinkle chocolate chips evenly over base. 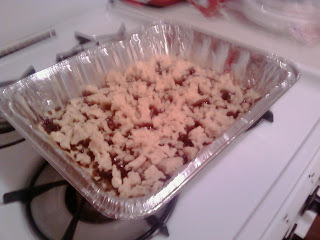 Carefully and evenly distribute jam over the chocolate chips. Allow to cool to room temperature and then refrigerate for an hour before cutting up.